GROUP has been well accepted as an useful design tool for analyzing the behavior of piles in a group subjected to both axial and lateral loadings. 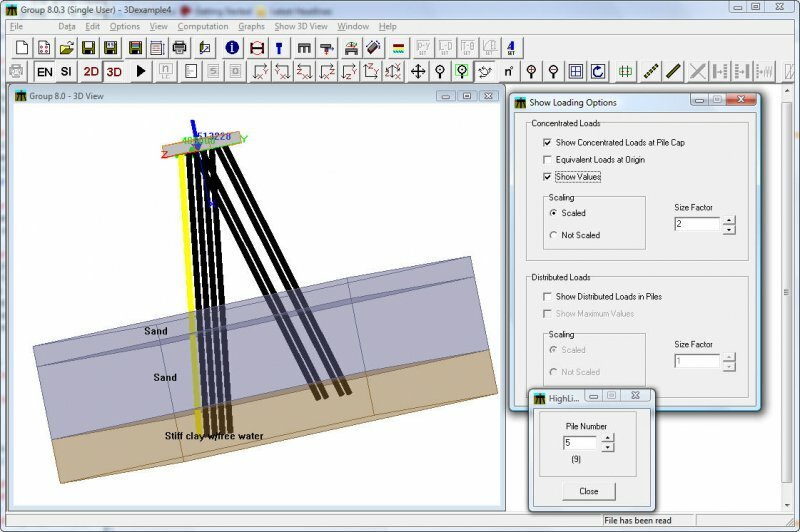 The program was developed to compute the distribution of loads (vertical, lateral, and overturning moment in up to three orthogonal axes) applied from any multiple locations in the pile cap to piles arranged in a group. The piles may be installed vertically or on a batter and their heads may be fixed, pinned, or elastically restrained by the pile cap. The pile cap may settle, translate, and/or rotate and is assumed to act as a rigid body. The program generates internally the nonlinear response of the soil, in the form of t-z and q-w curves for axial loading, in the form of p-y curves for lateral loading and in the form of t-r curves for torsional loading. A solution requires iteration to accommodate the nonlinear response of each pile in the group model. Program GROUP solves the nonlinear response of each pile under combined loadings and assures compatibility of deformations and equilibrium of forces between the applied external loads and the reactions of each pile head. The p-y, t-z, q-w and t-r curves may be generated internally, employing recommendations in technical literature, or may be entered manually by the user. The pile-head forces and movements are introduced into equations that yield the behavior of the pile group in a global coordinate system. 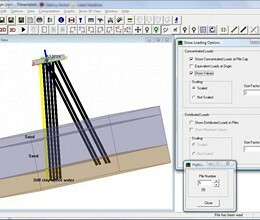 The program can internally compute the deflection, bending moment, shear, and soil resistance as a function of depth for each pile. For closely-spaced piles, the pile-soil-pile interaction (GROUP Effects) can be taken into account by introducing reduction factors for the p-y curves used for each single pile. As an option, the user can ask the program to generate internally some suggestions for p-multipliers to automatically reduce the soil resistance. GROUP is able to generate or lets users specify p-y reduction factors for two orthogonal axes. * GROUP download link provides demo version of the software. No one has rated GROUP yet. Be the first to rate this product.